CHHA Chilliwack Speechreading Level 1 – due to lack of registration, the class is cancelled until September. series of 10 classes are on Thursday mornings March 21 to May 23rd, 10 am to 12 Noon. Stephanie Bryant will be teaching the classes at CHHA-BC Resource Centre, 216-9181 Main Street. For more information and registration, please email: info@chha-bc.org or phone: 604 795-9238. CHHA Comox Valley Speechreading Level 1 series of 10 classes are on Tuesday evenings February 26 to March 26: 7:00 to 8:00 PM; April 02 to April 30: 8:15 to 9:15 PM. Nerissa Davies, MSc, R.Aud, R.H.I.P. (Registered Audiologist) will be teaching the classes in Room A at the Comox Recreation Centre on Noel Avenue. Room A has a Loop system in place for those with T-Coils in their hearing aids. For more information and registration please email: cvhearofhearing@gmail.com or phone: 250-334-4886. CHHA-BC Youth Peer Support Program is having their Post Secondary Workshop on Monday, April 8th, 12:30 to 3 pm at BCIT Burnaby Campus in Room SE02-212a. For more information check out their page here. The Canadian Hard of Hearing Association (CHHA) is pleased to collaborate with the Canadian Radio-Television and Telecommunications Commission (CRTC) and the Broadcasting Accessibility Fund (BAF) which promote accessibility measures and ensure they are in place. CHHA is grateful to the Broadcasting Accessibility Fund for its support of the creation of this guide. This guide examines the kinds of accessibility regulated by the CRTC which are designed to support people living with a hearing loss. 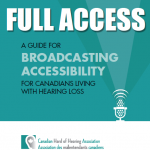 Full Access – A Guide for Broadcasting Accessibility is available for loan at CHHA-BC office or your local branch as a hard copy, or you can find the Guide in pdf format at CHHA’s National Accessibility Hub’s website. CHHA-BC Chapter, in a joint initiative with CHHA Vancouver Branch, has established a web-based Online Mentoring Program (OMP) for individuals with a hearing loss in British Columbia. The purpose of this program is to provide a medium for peer interaction, guidance, and the practice of coping skills through one-to-one mentor support. Check out CHHA-BC’s Online Mentoring Program as there are links to general information on various aspects of coping with hearing loss, from people who themselves have hearing loss; confidential one-to-one chatroom for those seeking guidance and mentoring in adjusting to their own hearing loss. This month’s CHHA-BC e-LOOP for April 2019 is available by clicking here or visiting the CHHA-BC Newsletter page. CHHA North Shore Branch offers Sound Advice monthly meetings which are held on the first Friday of each month from 10:00 am to 12 noon at the West Vancouver’s Senior Activity Centre, 695-21st Street in West Vancouver. There are no meetings in the months of July and August. Sound Advice is a monthly series of informal workshops and discussions around issues affecting hard of hearing individuals. For more information, call 604-926-5222. Are you a post-secondary student who lives with hearing loss? This scholarship was created in 2007 by Dr. Doreen Laszlo to honour the commitment and work of her husband on behalf of hard of hearing people. Dr. Charles A. Laszlo was the founding President of the Canadian Hard of Hearing Association and served on its Executive and Board of Directors in various capacities for 16 years. He also served as President of the International Federation of Hard of Hearing People. Dr. Laszlo also served a six-year term as the President of the Canadian Hard of Hearing Association Foundation. This scholarship is awarded to hard of hearing students who have shown both academic achievements in their post-graduate program and commitment to work on behalf of other hard of hearing people. This new scholarship is being offered by the North Shore Branch in memory of Carrell Hearn a resident of West Vancouver, BC who passed away in 2014 at the age of 105. Carrell was a long-time member and generous supporter of the CHHA North Shore Branch as well as a number of other local North Shore charities. If you are a post-secondary student who lives with hearing loss, you can apply for any of the CHHA Scholarships. To confirm if you meet the criteria to apply, please click on Scholarship program eligibility. The 2018 scholarship application form will be available online in October, with a deadline of March 31, 2019 at 3 pm (EST). Please click here to access the application or here for more information on the other scholarships offered by CHHA.